Actually I don’t love to run or jog or any other term you would like to use. 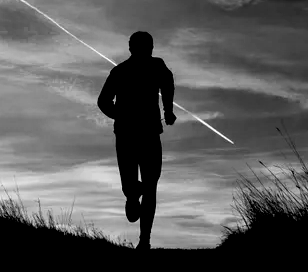 For a long time I got away from running because it hurt. I would much rather be on a bike even if it’s a stationary bike in my basement. I’m working on changing that shortsighted attitude because I know a well-rounded fitness program is much better for me in the long run (pun intended). I’m getting out for run/walk combination at least once a week now. My true motivation came a few weeks ago when I was trying to make a green light to cross a street. In that moment I realized that I couldn’t sprint. There was a disconnect between my brain and all of the parts of my body that are involved in getting from A to B quickly. Frankly, that scared me. It became bigger than getting across the street. What if I had to run from harm? Could I do that without hurting myself? What if I had to get to someone to save them? Sprinting on a more regular basis is now part of my life. It’s all about starting with reasonable goals. Every time I get out for run/walk I work to run more than I did before. I’ve also added in short sprints. I pick a landmark that may be just out of my range and get my short little legs moving as fast as they can. I won’t say it gets easier every time that I do it, but it’s not as painful as it was. My body is adapting to the challenge. I find that exciting and empowering! Plan an outside walk/jog/run based on your current abilities. Run as much as you can without creating too much discomfort. It’s much better to come home wanting more than wanting to throw your gear in the garbage so you never have to see it again. Each time you go out keep the distance the same and attempt to jog/run/sprint a little more. If you listen to your body you’ll know when the time is right to increase the distance you travel. In addition to or instead of the outside version, walk/jog/sprint inside. I don’t have a large basement but I have been sprinting the length of it (it’s really no more than 5 steps but several reps gets my heart rate up). Start with what you can handle even if it’s just once across and back. Build from there. To add a challenge, run forward and then backwards. An even bigger challenge is start each rep lying on the floor and jumping up to the sprint. It’s like adding a burpee to routine. Call me crazy. You won’t be the first one. I’m sure jogging/running will never be my favourite activity but it’s an ability I don’t ever want to lose. Besides, running really fast brings back some great childhood memories, and that’s always a good thing!